It is imperative that a suitable EIFS adhesive is applied to the back of the insulation board to ensure that it adheres to the substrate. 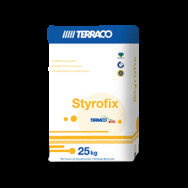 Terraco Styrofix PU Foam Adhesive - a one-component, low pressure polyurethane adhesive foam for fixing certain types of insulation boards to the substrate. A one-component, low pressure polyurethane adhesive foam for fixing EPS / G-EPS / XPS insulation board to a substrate. It is also used for filling gaps between EPS / G-EPS / XPS insulation boards, between the window / door frame and the insulation board, and for fixing external window sills. It has excellent thermal insulation and adhesive properties, is easy to use, economical, odourless, light weight and quick setting. The application method depends on the substrate onto which the insulation panel is being fixed. Apply Styrofix adhesive to 6 inner spots on the back side of the insulation board, ensuring it covers 40% of the surface area. Apply Styrofix adhesive to the external edges and to 8 inner spots on the back side of the insulation board, ensuring it covers 40% of the surface. Apply Styrofix adhesive to the entire back surface of the insulation board using a notched trowel.